And Brainstorm does offer some interesting insight. 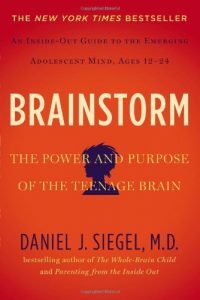 Siegel dispels the common myths of adolescence—that “raging hormones” cause teens to lose their minds and that it is a time of immaturity and the teens need to grow up. Siegel sees the time of adolescence as a period during which children can thrive, rather than just survive. Siegel’s view that adolescence “is an essential time of emotional intensity, social engagement and creativity” is solace to a parent who has wondered why her teen loses track of time when he’s out with friends and doesn’t just return the texts that his mother is lovingly sending him, with an increased sense of alarm. The changes in adolescence, the period that Siegel considers to last from 12 to 24, or long enough for most parents to lose their own minds, is characterized by four qualities—novelty seeking, social engagement, increased emotional intensity and creative exploration. Siegel believes that teens who focus on their peers to the exclusion of adults, engage in riskier behavior. Great news, teens need us! And Siegel suggests that as parents our challenge is to help our children find ways to “push life’s boundaries” without incurring assuming unnecessary risk. And that is where Brainstorm, like many self-help books, falls apart for me. Siegel recommends “authoritative parenting” that is “filled with warmth, limit setting and honoring of autonomy in age-appropriate ways” which all sounds good, except if you’re facing the problem of living in the real world and not being Mary Poppins. 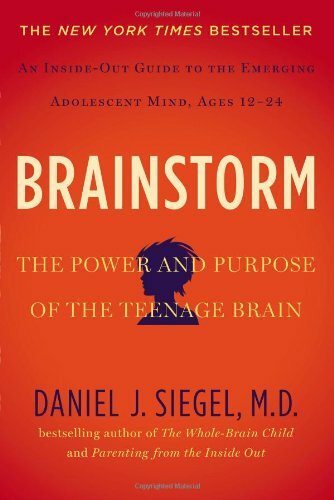 Siegel’s response to this, and other challenges of adolescence, is “Mindsight” a word that he invented that is comprised of three skills: insight, empathy, and integration. I must confess that all the Mindsight chapters read like complete mumbo jumbo to me, with the exception of the section that reminded me of the meditation session at Integral Yoga downtown. But for all the science talk, there are few studies and statistics to back up Siegel’s claims cited, leaving a void. Oh, don’t worry if you didn’t get that, because Siegel explains hyperrationality by using the example of Russian roulette. (Although for some reason Siegel suggests that the winner gets $6 million dollars). The chances of “winning” are good, according to hyperrationality, and the risks are minimized. This confuses the issue further, of course, because there is nothing rational about Russian roulette. Most people would agree that a “game” where one of the possible outcomes is suicide, is many things, including risky and stupid, but not a rational one, no matter how much cash is at stake. For all the problems I had with Brainstorm: the repetition, lack of science, poor writing and editing, and a bizarre section about attachment disorders that is littered with truisms, there were nuggets that I walked away with. One was from Mr. Rogers—the power of “Name it to tame it” (giving a name to an emotion to keep it manageable) and the reminder that teens pushing away from their parents does not mean that they are shutting them out entirely. Also, being reminded that this period in our children’s lives is, for all its mysteries and frustrations, nevertheless normal and important, makes it more bearable. Siegel states that “[t]he key for both generations is to be open to what is unfolding, to honor the person an adolescent is becoming through all of the many unpredictable stages and experiences this time entails.” How can parents do that while simultaneously setting limits to their adolescent’s behavior? Did you find the Mindsight exercises helpful? In the substance use section, Siegel explores different approaches to dealing with teen use of drugs and alcohol, from total banning to permitting the adolescent to experiment in a safe environment. Do you think it’s possible for parents to permit drug and underage alcohol use in the home without compromising their children’s well-being and ceding parenting authority? Please join us in August when we read and discuss The Blessing Of A Skinned Knee by Wendy Mogel.